DALLAS, Oct. 10, 2017 /PRNewswire/ — Texas Instruments (TI) (NASDAQ: TXN) today introduced two multi-switch detection interface (MSDI) devices that consume up to 98 percent less system power than conventional discrete solutions. The TIC12400 and TIC12400-Q1 are the first switch and sensor monitors that directly interface with resistor-coded switches. For more information, see www.ti.com/TIC12400Q1-pr. Manufacturers, especially automotive manufacturers, are challenged to integrate more functionality while saving power and space. The TIC12400 and TIC12400-Q1 can alleviate this challenge by natively monitoring the inputs and decoding the resistor path of as many as 54 switches in one device, offloading the signal decoding task from the processor. Additionally, by directly monitoring and providing built-in diagnostics for 24 channel inputs, the devices’ polling sequence architecture reduces the system microcontroller active time, significantly cutting system power usage for applications including automotive body electronics and factory and building automation equipment. 98 percent lower system power: Designers can reduce system power consumption from milliamps to microamps in applications that need high efficiency. On-device monitoring allows the microcontroller to go into a low-power sleep mode and use less power when idle, which is essential for applications like automotive start/stop or when a car is parked for extended periods of time. Reduced complexity in a 60 percent smaller footprint: Eliminating up to 120 discrete components, the TIC12400-Q1 features an input-sharing and matrix mode that helps monitor 54 switches and sensors. The highly integrated device also includes adjustable wetting currents, timing controls, thresholds and built-in redundant circuitry for protection, which increases system-level reliability by reducing potential points of failure. Robust, reliable system protection with simplified board layout: Integrated electrostatic discharge (ESD) protection and self-diagnostic features reduce external protection components. The new devices meet International Organization for Standardization (ISO) 10605 ±8-kV ESD protection requirements, preventing potential fault events from damaging internal circuitry. The fully configurable devices independently monitor and protect 24 inputs, providing more headroom for the host microcontroller to perform other functions. The TIC12400 evaluation module (TIC12400EVM-KIT) enables designers to quickly and easily evaluate the new device’s capabilities. It is available from the TI store for US$199.00. Designers of automotive body control modules can decrease system cost and vehicle weight by leveraging the new device to create a smarter, more centralized architecture, reducing the number and overall weight of wires going into the harness. Explore how the TIC12400-Q1 can decode high-voltage switch inputs in the Automotive Multi-Switch Interface Reference Design. The TIC12400-Q1 and TIC10024-Q1 are the latest innovations in TI’s complete interface portfolio that provides efficient, robust and reliable data communication for any application. Watch the TIC12400-Q1 in action. 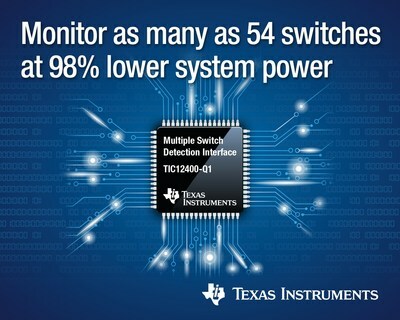 Explore TI’s portfolio of low-power, highly integrated switch and sensor monitors. Check out TI reference designs and other resources for body control modules. Search for solutions, get help and share knowledge in the TI E2E™ Interface Forum. TI E2E is a trademark of Texas Instruments. All other trademarks and registered trademarks belong to their respective owners. This entry was posted on Tuesday, October 10th, 2017 at 9:08 am and is filed under Advertiser, News.